This week’s clam recipe is perfect for grilling in your backyard. 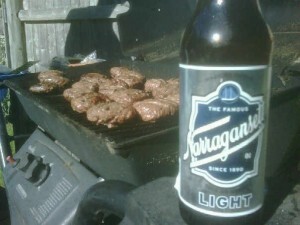 Best paired with a ‘Gansett light this dinner idea is a great way to switch it up from the normal burgers or have as a starter to your BBQ. However you choose we hope you enjoy these delights! Scrub the clams and place them in several changes of cold salted water for an hour or two, to purge the sand. While they are soaking, start the grill and prepare the sauce: combine the remaining ingredients in a small saucepan and heat slowly until the butter thas melted; then simmer. When grill is hot, place the clams on it, about 5 inches above the heat; cover them, and allow them to “steam” open. When the clams are fully opened, after about 5 minutes, carefully remove them from the grill. Try not to spill their juices. Ladle a teaspoon of the butter sauce into each clam and serve immediately, with grilled garlic bread.